1 You are a RESIDENT INDIVIDUAL. If both the above conditions are satisfied, rebate of Rs 2.500 will be available under Section 87A. The rebate is limited to Rs 2.500. Which means if the total tax payable is lower than Rs 2.500, such lower amount of tax will be the rebate under section 87A. 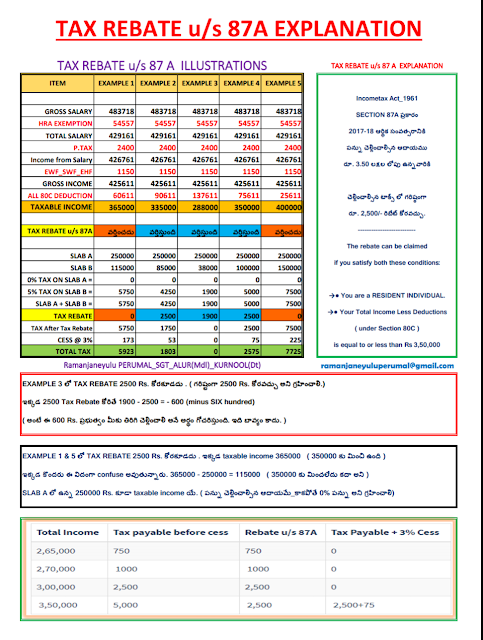 This rebate is applied on total tax before adding Education Cess(3%). This rebate is also available to Senior Citizens who are 60 years old but less than 80 years old.